One of the true Keyblade Masters and also Terra, Aqua and Ventus's teacher. He has a strong aversion to darkness, and believes it the duty of every Keyblade Master to rid the world of it. Though strict on the outside, he is not unkind, and loves his pupils like his own children. The true Keyblade Master who mentored Terra, Aqua, and Ventus. He was struck down by his own brother-in-training, Master Xehanort, in the clash over a decade ago. "Fear leads to obsession with power, and obsession beckons the darkness." Eraqus, known to his students as Master Eraqus, is a Keyblade Master featured in Kingdom Hearts Birth by Sleep. He is the master of Terra and Aqua, and he also serves as the second master of Ventus. Master Eraqus was conceived as a Final Fantasy-esque counterpart to Disney's Master Yen Sid, given that his name is an anagram of "Square", a reference to Square Enix, the developers of the Kingdom Hearts series, and his resemblance to Hironobu Sakaguchi, the creator of Final Fantasy mirrors Yen Sid's name being an anagram of his creator's name, Walt Disney. Tetsuya Nomura once forgot the basis of Eraqus's name, and had to be reminded by an employee that it was an anagram of "Square". In the English version of the series, Eraqus is voiced by Mark Hamill, who was chosen specifically by Nomura because of his role as Luke Skywalker, his love of the Star Wars series, and his desire to pit Star Wars and Star Trek (a series that Nomura is also a fan of) against each other in a "dream match" by casting Star Trek's Leonard Nimoy as Master Xehanort, Eraqus's friend turned rival. In Scala ad Caelum, Xehanort asks if Eraqus had heard of the Keyblade War during a game of chess, pondering what the Keyblade wielders had planned on doing with Kingdom Hearts after making it appear. Eraqus is equally as unsure, not understanding why anyone would initiate a war in the first place. With this, Xehanort asks if Eraqus knows the "Lost Masters" - those who either initiated the Keyblade War or for whom the Keyblade War was initiated. When Eraqus feigns ignorance, Xehanort reiterates a portion of the text from the Book of Prophecies: "On that land shall darkness prevail and light expire," suggesting that a prospective Keyblade Master should know this. Unconvinced, Eraqus suggests that the future could be changed in favor of light rather than darkness, despite the odds being against him. Eventually, Xehanort declares checkmate as Eraqus's king is surrounded. Rather than accepting defeat, Eraqus moves his king back to his side of the board and calls on the seven lights from the past, which then allow Eraqus to outmaneuver Xehanort and emerge victorious. Xehanort accepts his defeat, admitting that when the world needs a defender, they'd pick Eraqus. Even so, Xehanort offers Eraqus his support, and Eraqus offers the same. Eraqus is then reminded of a new game he had heard of, filling the board with seven black pieces and asking Xehanort pay attention as he places his sole white piece. Eraqus warns Xehanort that recreating the χ-blade is a ridiculous idea. After passing the Mark of Mastery exam, Eraqus becomes a Keyblade Master and is entrusted to safeguard the Land of Departure while Xehanort leaves to travel the worlds as a Seeker. When the two meet again, Eraqus learns of Xehanort's scheme to cause a second Keyblade War in order to recreate the χ-blade and attempts to fight his former friend to stop him from carrying out what would destroy everything. However, his attempt is futile as Xehanort quickly takes him down and scars his face. Years later, Eraqus obtains apprentices of his own, Terra and Aqua, before taking Ventus under his wing from a seemingly repentant Xehanort. Master Eraqus starting the Mark of Mastery exam. Eraqus holds the Mark of Mastery exam for Terra and Aqua, with Ventus and Xehanort as witnesses. In the end, Eraqus names Aqua master while refusing to give Terra the mantle on the grounds that he is unable to control his darkness. Despite the formality, Eraqus confides to Terra that he has the potential to become a Keyblade Master. Little does Eraqus know that Xehanort had used his dark powers to tamper with the course of the Exam itself. Soon after, he conveys to Aqua the responsibilities that go with her status and what she is required to do if he died for any reason. With Xehanort no where to be seen, Eraqus sends Terra and Aqua to find him shortly after being contacted by Master Yen Sid about the spawning of the mysterious Unversed. Sensing a possible connection between the two events, Eraqus later instructs Aqua to look after Terra, as he fears his apprentice may be tempted by the darkness. However, after Terra departs, Aqua and Eraqus witness Ventus leaving as well, and he instructs Aqua to bring Ventus back. Master and apprentice face off. Upon seeing Ventus later returning, Eraqus welcomes him back home with open arms, only to find the boy confused and enraged as he questions him about the χ-blade and his role in its creation. Eraqus, realizing that Xehanort never intended to give up his agenda and revealing to the boy his role in the plot, sees killing Ventus to be the only way to put Xehanort's plot to an end for good. However, Xehanort arranged Terra to arrive to save Ventus from Eraqus. Sensing that Terra has indeed descended into darkness, the youth refusing to let him kill Ventus, Eraqus is left with no choice but to eliminate them both. However, after throwing Ventus into a portal leading to the Destiny Islands, Terra mortally wounds Eraqus. In the end, Terra regretting fighting him while he sees that turning his Keyblade on his own apprentices was an error on judgement, Eraqus is impaled from behind by Xehanort and fades in Terra's arms. Avenging Eraqus's death was among Terra's primary motives for defeating Xehanort during the events in the Keyblade Graveyard. However, after Xehanort uses Terra's body as the first of his vessels, he learns that Eraqus entered Terra's heart and thus gave him the means to resist Xehanort. After Master Xehanort is defeated and mortally wounded by Sora, Eraqus leaves the newly-freed Terra's body in spirit form and persuades Xehanort to stand down, despite Xehanort's final attempts to enact the purge with the χ-blade. As Xehanort respectfully hands the χ-blade to Sora to close Kingdom Hearts, Eraqus shares a warm reunion with his three apprentices and entrusts Aqua's and Ventus's care to Terra before joining Xehanort as the two fade away peacefully as friends once again. Terra, Aqua, and Ventus later place Eraqus's Keyblade in the ground in the Land of Departure as a makeshift gravestone to honor their fallen master. Master Eraqus has slightly tan skin. He has jagged scars over his right eye and left cheek inflicted by Master Xehanort, much like the wounds Braig received from Terra. Eraqus's black hair is tied into a short, high topknot, with one bang falling off to the right side of his face. He also has a short, triangular soul patch and a mustache. Master Eraqus, like his student, Terra, bears a distinct Japanese influence in his choice of clothing. He wears a white, red-lined haori that has a hood, along with slightly shorter than normal, light-colored hakama. Underneath his haori, he wears a navy blue shirt with a large white X pattern on the front. Like his pupils, Eraqus wears pieces of armor, in his case gold and black armored boots and a dull blue-green section that covers his abdomen. This second piece of armor sports the same symbol worn by his students near the top. 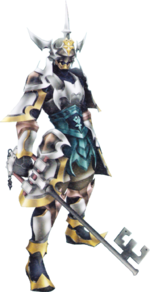 Eraqus's Keyblade Armor greatly resembles samurai armor, fitting in with his Japanese theme. When fully immersed in his Keyblade Armor, Eraqus features primarily white plating with highlights of gold and bronze. Master Eraqus physically resembles Hironobu Sakaguchi, the creator of the Final Fantasy series. Master Eraqus is a strong Keyblade master, caring for Terra, Ventus, and Aqua as his own children. Stern and willing to instruct, one major goal he has in life appears to be preserving peace throughout the worlds, as he rashly attacks Ventus when Eraqus discovers that through his dark half, Vanitas, Ventus can create the χ-blade. Unlike Master Xehanort, Eraqus has a staunch and almost bigoted aversion to darkness and believes that it must be destroyed at all costs, a view that he has endeavored to ingrain into his apprentices. In his final moments, he even becomes concerned that his actions against Ventus and Terra were due to some darkness having snuck into his heart. Despite his sometimes cold actions toward his apprentices, he still cares deeply for them. He has Aqua follow Terra out of concern for the youth, gives a pained apology to Ventus before attempting to destroy the boy, and sheds a tear when he is forced to face off against Terra. Despite the strain between him and Xehanort, Eraqus attempts to forgive his erstwhile friend, even welcoming him to help preside over the Mark of Mastery exam despite their last meeting ending in violence. Following his apparent demise at Xehanort's hands, Eraqus's influence and strength settles within Terra in order to help him counter Xehanort's possession and hopefully regain his body. Despite some of his extreme measures, Eraqus is a forgiving person at heart as he takes Ventus in, despite the fact Xehanort scarred his face, and in the final confrontation with Xehanort years later, he persuades Xehanort to peacefully surrender and escorts Xehanort to the afterlife as his friend. Master Eraqus serves as a boss for Terra, after Terra prevents him from executing Ventus. During battle, Eraqus uses many quick lunging attacks, and is able to land many hits before the combo finisher. He also has several desperation attacks, each based on the light element. Master Eraqus wields a rather basic Keyblade named "Master's Defender", which is grey in coloration. It has the appearance of an old fashioned skeleton key, and the teeth are shaped like an "E". Its Keychain is the Mark of Mastery symbol. He summons his Keyblade in a fashion similar to Terra, shrouded in a series of golden blocks. In battle, he holds his Keyblade in the chūdan-no-kamae stance. ↑ The Making of Birth by Sleep - Addendum w/ Tetsuya Nomura - "Usually I choose actors whose voices are similar to the Japanese version, but this time around I focused more on candidates who were simply a good fit for the character. For Eraqus and Xehanort, I chose actors who I felt personified these characters best, but also wanted to be a bit playful in my decision-making." This page was last edited on 3 April 2019, at 19:22.